Face Mapping: What Your Skin Says About Your Health.. While sophisticated MRI and X-Ray machines leave little to the imagination, they haven't been around that long. Human disease and disorders, however, precede them by millennia. Instead, ancient medical practitioners have used nuanced observational diagnoses to quickly narrow down symptoms to specific imbalances within the body and help prevent or correct future disease. The same techniques can still be used today to read the skin on your face to help determine what's causing flare-ups or blemishes. 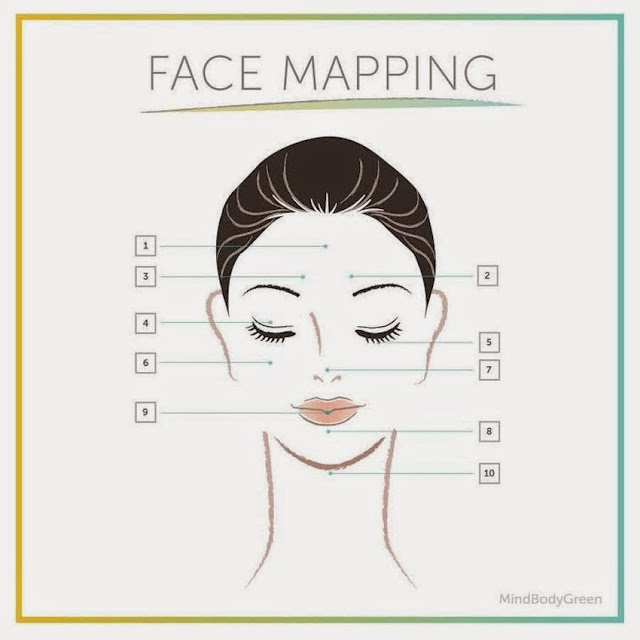 "Face mapping," an ancient practice rooted in Ayurvedic teaching, connects a point on your face to an organ or body part so you know what to treat internally for clear external results. Might mean: Gallbladder and liver issues.. According to Ayurveda, the forehead is ruled by the Vata dosha and relates to the nervous system and digestive system, meaning stress and internal stagnation are probably causing breakouts here. Try reducing the amount of processed foods and fat in your diet sure to eat less processed foods, while incorporating meditation and yoga to keep stress low. 02. Between eyebrows, right side..
Might mean: Repressing emotions in your liver..
It’s apparent to most that deep seated anxiety would cause your lovely face to wrinkle up, but understanding the line pattern can help you understand where you might be holding stress and which of your organs may consequently be most at risk. If you have a vertical line between your eyebrows on the right side, it indicates you're repressing emotions — especially anger — in your liver. 03. Between eyebrows, left side..
Might mean: Repressing emotions in the spleen..
Might mean: Joint problems, intestinal issues, thyroid problems..
Might mean: Impaired kidney function..
Might mean: Slow metabolism, low absorption of nutrients, lung issues..
Not based in Ayurveda, but it's important to note that acne on the cheeks might be caused by a dirty cellphone and pillowcases, or a tendency to touch your face a lot. Make sure to keep your hands away from your face, and accessories and sheets clean. Might mean: Blood and heart issues..
Because the cheeks and nose are governed by the Pitta dosha (the fire element), it's no surprise that breakouts here indicate an internal flare up. The nose is closely related to your circulatory system, so if you find yourself breakout out there, it might indicate a blood pressure issue. Up the amounts of essential fatty acids in your diet (avocado, flax, olive oil), and avoid alcohol, coffee and spicy foods. Might mean: Toxin buildup, lung issues.. Your tongue is the first place many internal disorders will show up, so you'll want to inspect it every day (preferably in the mornings). Circular white residue in the middle or the back of the tongue indicates a build up of toxins in the intestines or colon, meaning it might be time for a detox. Your chin is most likely where hormonal imbalances and stress will make themselves known, which means you're more likely to break out there around your menstrual cycle. Reducing stress as much as possible, getting adequate sleep and exercising will help heal blemishes around this Kapha dosha-ruled area.